Spin, agendas, gravy and blazers – let's set all that aside for right now and deal in some hard facts. We know Media House has been contracted by Rangers to do work on behalf of the board. Simple fact, no question. However, in his interview with The Herald that dropped this morning CEO Craig Mather said, "Media House were here anyway. Media House had a contract here that came to an end in August and we renewed that." Purely a misconception on behalf of the wider support, various media outlets, bloggers being fed info by Media House and Jack Irvine himself. 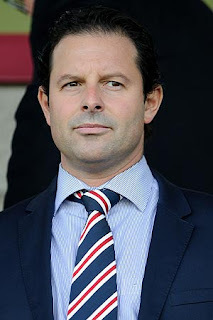 For, if you remember, on 14 August it was reported that Media House had confirmed an end to its contract with Rangers. It was said that the PR firm which had failed us so consistently had ended its relationship dating back to 2006. 1) Media House and the board were lying and the contract had a renewal clause that had been activated as Mather said today, none of which had been hinted at in any report prior or acknowledged by the Club. 2) Mather lied in his interview today by saying that Media House had been here the whole time. In either case, Rangers are now employing three PR firms, one of which, Keith Bishop Associates, appears to be nothing more than a £130,000 per year rider attached to the Sports Direct deal, and the other of which has been an abject and much derided failure in defending the Club, its supporters and its interests during its seven year stay. Not to mention Newgate Threadneedle, and our Communications Director Jim Traynor who was brought in to run the whole show. All told, we have four separate entities being paid to produce PR work for Rangers at the moment. We should be seeing a release (or a BBC exclusive) at the top and bottom of every hour at that rate. Next fact: Mather in his interview says, "We bought Edmiston House for £1m, we bought Albion car park for £1.6m..."
Let's revisit out old friend Imran. You know, our ex commercial director who reportedly plans to sue the Club for £3.5m just to sink it back in out of "principle." Imran in his figures given to Bill McMurdo stated that Edmiston House was purchased for £1.5m and further claims that when developed it will generate fully £2m per year in revenues for the Club. So is it £1.5m as the ex commercial director and man behind the dream team on the board claims or is it £1m as our current CEO who decided to re-hire/re-new the contract of Imran's PR team claims? And in either case, who gets the five percent kicker? To the Albion, Imran in the same blog from McMurdo claimed categorically that he "saved the club £3.5m over 10 years as lease was an astronomical 350k per year." As pointed out by many prior, why not claim a savings of £35m over 100 years if we're working in such terms, even though Imran's claims in his intended suit are based solely on realized "cash profit" for the Club. 1) If the figure stated by Mather is correct, Imran's claim is garbage as he would have saved the club merely £2.5m over ten years (or £34m over 100). 2) If Imran's figures aren't correct, and remember he's openly planning to sue Rangers (just to put the money back in), why have none of our three PR arms refuted this ridiculous and well reported claim? Media House is there "to defend Rangers Football Club" according to head honcho Jack Irvine. Surely spurious claims from former commercial directors would be in their sights, no? Back to Mather, who touts further savings as "We have brought security back in house." "In house" is a relative term, is it not? For the "in house" security firm is a separate entity, Garrison Security Services Ltd, featuring Charles Green and Brian Stockbridge as its sole directors. Now of course we have to wait for those audited accounts to see just what the savings are and what the outlays to this firm have been. In either case, calling it "in house" when it's a separate entity overseen by a current Club director and our ex CEO is perhaps a bit misleading. Or is it in fact "in house" and Charles still has a say on operations? On to the return of Big Chuck, where Mather says, "I looked at the views of our fans and reacted quickly and decisively to address that." This was decisively addressed by first bringing him back over a weekend, days later sitting in front of assembled fans and saying that the position of a consultant, presumably answerable to the CEO himself, would be considered within the week, then delaying this meeting until the week following the stated deadline, upon which Charles resigned. Decisive action indeed. On the John Greig email from the Whyte era: "I do not know anything about that [email] but I have asked people to go digging on that and come back with a mini-report so I can judge that accordingly." Here's a link to the email. In fact, here's the direct quote about the man you yourself call a "legend" (we didn't need reminding): "Greig is just thick and contributes nothing." The man who got you this interview (allegedly) in The Herald today wrote that two years ago. The man whose company you either variably ceased doing business with or continued to do business with despite their saying that the contract with Rangers had expired. The company that failed us with UEFA, the Scottish media at large, shilled for Craig Whyte and now represents you (or has the whole time). So hopefully you now have enough information to comment further. Asked, "What about spending £80,000 on an egm while paying Media House to defend you too?" the response again presented the same Media House Complex™ that seems to be an issue here: "Media House already had a contract. This is a renewal." Renewal or expired and re-hired, either way it was a choice to retain Media House's services when we already pay for one do-nothing PR firm and our own Director of Commutations. How one turns the cost savings of an egm into "It's okay for us to pay for four wholly separate PR outlets" is a bit strange. But hey, we're still rolling in the money right? Which brings me to a final point, and one with Mather did not address. How is it leaked December accounts (might want to pin down who's running the Xerox, by the way), the ones which I presume are at least in part the basis of the "everything's okay" argument Mather put forward in this interview, show a projected net gain of over £7m for the commercial operations of Rangers? And need I remind who was in charge of those operations at the time? How, if that is viewed as a reasonable outlook of the finances, and given the figures Brian Stockbridge presented to us in an exclusive interview not long ago, can we believe that there is nothing to worry about? Mather went well out of his way to talk up revenue streams but failed to once mention or even hint at what the outgoings were. Was he unaware that a document was floating around Twitter showing anyone who cared to read just what was going on with the money? Should his new/old PR team not have briefed him on this prior to the interview? In the end, there were a lot of "facts" that were woefully unrepresented in today's first effort by Media House to show us why it's all okay and that they've got it all under control. They were here all along, mind. Except for when they said they weren't. So let's wait for the next "it's all okay so long as you ignore the small details" exclusive. Or maybe a tweet or two from the well regarded (at least in some PR circles) BBC journalist Chris McLaughlin. Maybe by then they'll have their facts straight.